The World Water Day – convened annually by the United Nations – will take place on March 22nd, 2019 and is aimed at drawing attention to the importance of water as a livelihood for humanity. This years´ world water day is using the motto “Leaving no one behind – water and sanitation for all”. 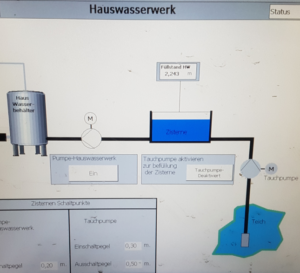 Not only on one day of the year the topic of water management is of major importance: AKW Equipment + Process Design is facing this topic on a daily basis. Water is indispensable in our daily business duties as we strive to design the best-in-class wet mechanical treatment systems that also integrate performing process water recycling solutions, and so it also is in our daily life for food, drink and sanitary facilities. For any of his expansion or development plan, the company is systematically integrating the water cycle optimizing as a key performance indicator. Water saving, or water re-use has been and remains a top priority by us! Saving opportunities – how does it work? One great example of the company commitment occurred some years back, when AKW Equipment + Process Design achieved a major milestone in its development, with the opening of a new and enlarged technical laboratory, test center and warehouse, located on a total ground area of 900m². In this construction, several options for individual water supply had been considered: a special system for rainwater collection was integrated, that can be connected from various terminal points in the building. 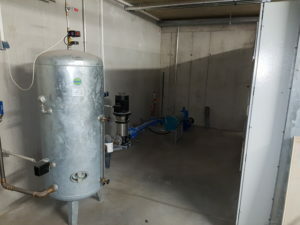 A rainwater collection cistern, with a filling capacity of 30m³, was installed in the basement of the wet-testing area of our technical laboratory. While, when performing a wet mechanical test, it is a must to utilize tap water quality, after all test equipment have being used and the test run finished, we use the rainwater collected for flushing and rinsing of all the equipment. As a result, about 70% of the yearly water consumption of the technical laboratory is provided by rainwater. The domestic waterworks installed in many single-family houses are well-known. For the utilization at AKW Equipment + Process Design such common systems are not sufficient, hence a bigger waterworks system was integrated. To give an idea about the differences, a technical data comparison of a common domestic waterworks and the system installed at AKW Equipment + Process Design is presented in the following table. With our rainwater collection system, we have taken a significant step in the right direction. However, we should not forget to constantly inform ourselves about new water saving options. 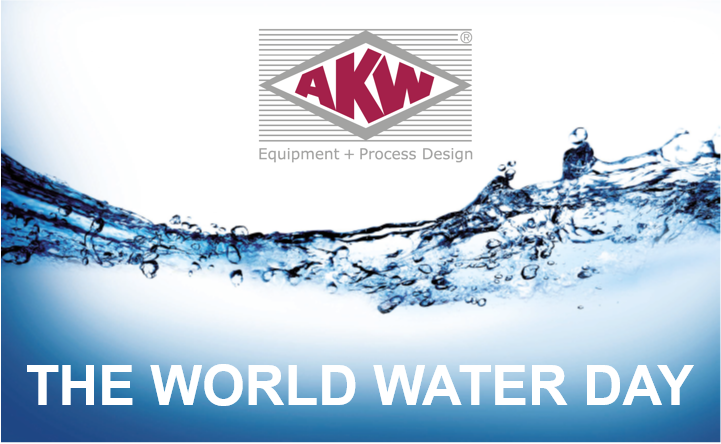 All employees of AKW Equipment + Process Design are sensitized and committed to find new opportunities for water saving. Setting new connection points to use the available rainwater for irrigating the garden or investing in a system to purify the rainwater, are some of the investigations currently being made. Last but not least it has to be stated, that not just our own behavior helps saving water, also our proven equipment for process water recycling contribute to fresh water savings! 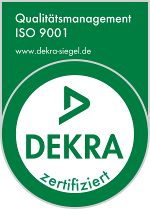 When we look back to the year 2018 we can record at our headquarters in Hirschau approx. 238m³ of fresh water use for the office buildings. For the technical laboratory and warehouse – directly on site – this quantity amounts for only 281m³.